Where I got it and why: From the library, for alas, I still cannot find a copy of this locally. (I’ll just have to order it, I suppose…) The final book in Daniel Abraham’s Long Price Quartet. Recommended: Oh god yes. A spectacular ending to a spectacular series. You want to read this. Review: Once again, it cannot be avoided, there will be SPOILERS for this and previous books in this review. It is fifteen years since the end of the world. The Emperor Otah Machi has been fighting for the survival of his people, and negotiations with Galt are finally going smoothly. With luck, marriages between Galtic women and Khaiate men will be commencing, initiated by the marriage of the Emperor’s son Danat to Ana, the daughter of one of the Galtic High Council. But Otah’s daughter Eiah can’t support his plan — she thinks he’s throwing away a whole generation of women just because they can’t bear children. She’s turned to her Uncle Maati, who is convinced that with female students, he can rewrite the grammar and bind a new andat, one who can restore the world to the way it used to be. He’s wrong. Nothing will ever be the way it used to be. They say that good versus evil is a fine basis for a plot, but if you really want to wrench people’s hearts, try good versus good. This book isn’t quite to that level, but it’s close. The Price of Spring alternates between Otah’s and Maati’s points of view, giving the reader plenty of opportunity to compare their diametrically opposed and equally stupid plans. Otah thinks he can just move on without healing any of the wounds caused by the war; Maati thinks he can make the war never have happened. You can see the end from here, and it doesn’t look pretty. That problem I was having with the earlier books in the series where I’d put it down and forget about it for a week? Not happening here. The pace in this one is perfect, steady and almost doom-laden. Every note I wrote in Goodreads as I updated (and several more that I didn’t bother to type in) was some variation on “Really, Maati, you didn’t see that coming?” And while Otah’s plan for the future is clearly more than a little short-sighted, Maati’s has all the fascination of a train wreck. It’s skillfully executed; you can tell that Abraham has been improving throughout this series, which is always good to see. There are still two things that bother me about this series, which unfortunately wouldn’t be so bad if it wasn’t so well-written. First of all, this is a wonderfully-realized, complex world, with several cultures, plenty of variation within those cultures, and all kinds of people within them. And every one of them is straight. Oh, there is finally a mention in this book of someone who might possibly have been less than straight at one point in the past, but that’s it. With such a detailed world, the omission starts to seem glaring. The other problem I have is with the female characters. They’re great characters, don’t get me wrong – I love Eiah, and the mad poet Vanjit is a fascinating character. The problem I have is more with the overall shape of the story: with one possible exception, there are no female characters who succeed at anything. Anything other than marriage, that is. Idaan tried to take over the throne in A Betrayal in Winter, but was caught and cast out; now she is happily married to Cehmai. Kiyan does a fine job of managing the city in An Autumn War, but that was something she did out of necessity, not a goal of her own. Despite her business success, Liat is portrayed as incredibly unhappy. And then, of course, Vanjit becomes the first female poet and goes mad. It’s a slightly depressing pattern. I do often complain that fantasy is annoyingly unrealistic in its treatment of women, usually preferring to pretend to equality rather than dealing with any issues with the lack of gender equality, but I don’t think the alternative is to leave women with nowhere to go. 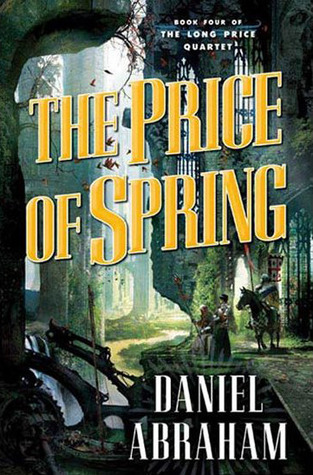 Despite these small complaints, I found The Price of Spring a wonderful, satisfying conclusion to an incredible series. I highly recommend it to anyone who likes fantasy with strong, interesting characters and well-rounded worldbuilding. If you’d like to see someone else’s take on the series, check out Jo Walton’s reviews at Tor.com. Where I got it and why: From the library, since there isn’t a bookstore in town with a copy and I needed it NOW. Third in Daniel Abraham’s Long Price Quartet. Recommended? : Oh yes. But this is definitely a series you read in order — get the first two first, and look forward to this one. Review: There is something about these books that causes me to get stuck about halfway through, leave it be for a few days, and then pick it up and drive straight on to the end. I’m not sure if it’s a lull in the action or what, but this is the third time it’s happened. I am so glad I did pick it back up, though, because this book is easily the best in the series so far. And a warning: we have reached the point where it is inevitable, there will be SPOILERS for the earlier books in the rest of this review. Some fifteen years have passed since the events of A Betrayal in Winter. Otah is now Khai Machi, responsible for an entire city. He has, scandalously, only one wife, and his only son Danat is sickly. His daughter Eiah, being a teenager, is starting to act out, despite the careful guidance of her beloved Uncle Maati. Into this relatively blissful domestic scene comes Liat, the former lover of both Maati and Otah, with her grown son, who had been raised by Maati when he was small but who is now so visibly Otah’s son that his presence is likely to cause even more scandal. Not as much, though, as the news Liat brings with her: the Galts are going to attempt an invasion. For centuries the andat, the incredibly powerful beings held by the poets of the great cities, have protected them from the technologically advanced, militaristic Galts, but Galtic General Balatar Gice has dedicated his whole life to destroying the andat. No one, he thinks, should be allowed to have that much power – control over a being who could pull down whole cities with a thought, or destroy the crops of an entire country, or cause ravaging floods and devastation. He has gone into the desert that used to be the old Empire, he has found a poet of his own, and he is going to first destroy the andat and then any possibility that they will ever return, even if that means destroying every one of the great cities on his way. All of the cover blurbs on this book talk about the amazing ending, which usually puts me off because most of the time, knowing the twist is going to come, I can predict it well in advance. Not so much in this case. The climax of this story hits that perfect combination of exquisite foreshadowing and total surprise – Once you get there you realize there is no way it could have gone any differently, but it was so completely not what you were expecting that it feels like a punch in the gut. In a good way, of course. Abraham’s characters are exquisite, and as the world becomes more familiar the deeper you get into the series, the characters take their places as the highlight of the book. Otah, Maati, and Liat have all changed so much since A Shadow in Summer, grown both in wisdom and in their flaws, but they’re still deeply recognizable as themselves. It’s the characters who make that ending what it is, because it’s the characters, their drives and disappointments, the whole history of their lives, that make it so inevitable. It’s a wonderful study in how good people can do horrible things in pursuit of good causes, and there is no one, from the Galtic general to the treacherous mercenary, who you can really blame. Everyone is doing the best they can with the options they have, they’re just terrible options. It is, in fact, very like a Greek tragedy; if they were different people it would have gone differently, but they aren’t, so how could it? In any other series, this would be the end. This book ends with an earthshattering change, but there are possibilities for growth and rebirth still visible. Most writers would have left it there, but there is another book in this series, and I can’t wait to see what happens next. Recommended? Yes, particularly if you’re a fan of second-world fantasy plus politics – and of course if you liked the first one. The Khai Machi is dying, and his sons must start killing each other – only the sole survivor can be his heir. The Khai has three official sons, but there is also the fourth – Otah Machi, who was sent to the poets’ school as a child, but who, uniquely, neither became a poet nor rejected his claim to his father’s throne. As soon as people become aware that he is still alive, he becomes known as The Upstart, a frightening, half-legitimate figure in the shadows. And so, to be sure that chaos does not ensue, the Dai-Kvo, head of the poets’ organization, sends the disgraced poet Maati to the city to find Otah, determine if he has been illegitimately murdering his brothers, and stop him if he can. The problem is, Maati still loves and respects Otah, and is sure he is not the one behind it. He’s right. This is no spoiler; rather than being structured as a mystery, the book lets you follow both the criminals and the investigators at the same time. The murderer is Idaan, the Khai’s daughter. Frustrated at her position in life – destined to be married off for political power – she has developed a plan to make her fiancé the new Khai, by killing all of her brothers and pushing his family to the top of the political structure. It would be the honorable thing to do if she were a man; since she is a woman, it is a terrible crime. I found this one a little harder going than A Shadow in Summer. Possibly this was because I didn’t connect with as many of the characters. I still liked Otah’s reluctance to get involved and his eventual realization that not getting involved was going to be disastrous, but Maati seemed to exhibit a lot of learned helplessness in this book, and the Machi poet Cehmai just didn’t do much. I wanted to like Idaan, but about halfway through I thought to myself, I wish this wasn’t yet another story about a woman being slapped down hard for stepping out of her place. If Abraham wanted to explore the awful ways the tradition of succession damages people (a genuinely interesting subject), he could have at least done it with a male character. All of which makes it sound like I didn’t enjoy the book. I did, and I continue to love the worldbuilding and the andat and the way he explores the long-term consequences of peoples’ decisions. 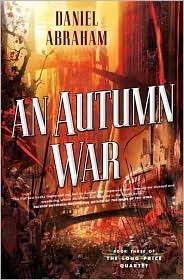 I will absolutely be reading An Autumn War as soon as I can get my hands on it (unfortunately there isn’t a bookstore in town that has a copy for sale). But this is a dark book, slow-paced and melancholy, and with the blush of new love fading from the series, I found it a little more work to get through. Where I got it and why: from the library. It’s been on my to-read list for a while, but Jo Walton just recently reviewed the whole series over at Tor.com, and that provided that final kick. Recommended? Hell yes! Anybody who loves second-world fantasy, unusual worldbuilding and magic, and character-driven plots will love this. 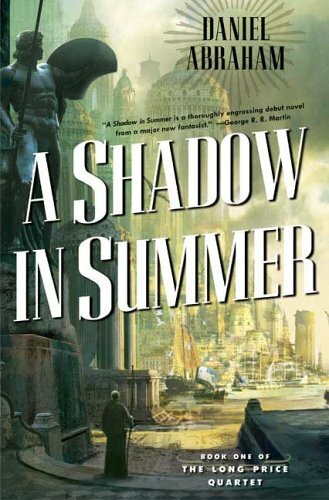 Review: A Shadow in Summer is the first of the Long Price Quartet, and Daniel Abraham’s spectacular first novel. It’s of the genre I’m inclined to call “epic fantasy,” except for most people that means swords and elves and Good Versus Evil, and what I mean by it is just second-world fantasy with a huge cast and extraordinary world-building. And let me tell you, this has it in spades. It’s hard to say who the main characters are because everyone is important in their own way. There’s Amat, the aging overseer for House Wilsin, who was good friends with the head of that house until she found herself objecting to his political tactics, and Liat her apprentice. Maati, the apprentice to the poet Heshai, and his extraordinary relationship with the poet’s slave, the andat Seedless. And the remote Khai, the ruler of the city; the vile pimp who Amat finds herself working for for a time; and not least, Otah, who could have been a poet but refused the brown robe. Aside from Otah’s prologue, the action all takes place in the city of Saraykeht, one of a number of loosely allied city-states each ruled over by their own Khai. The cities of the Khaiem have one thing in common that holds them together against other nations like Galt, and that is the andat. The poets describe the andat as “an idea translated into a form that includes volition.” They’re essentially the embodiment of an idea that has been described and enslaved by the poet, who is then responsible for holding and controlling the andat. The andat for Saraykeht is Removing-the-part-that-continues, called Seedless — and he’s central to the city’s dominance of the in the cotton trade. No cotton gin for them, they have an andat to pull the seeds from the cotton. And Galt, a nation whose dominance is in military rather than in economic matters, knows that the only way to conquer the cities of the Khaiem is to remove the andat. House Wilsin is their tool in a plot to drive the poet mad and force him to release Seedless, destroying Saraykeht, and the plot of the novel revolves around not only this plan but on all the characters’ various reactions, objections, and desperate attempts to halt or at least avenge the Galtic scheme. It’s an amazing world, based on Asian cultures in the same way that most fantasy is based on European cultures, with no direct parallels to real-world cultures and nations but providing the overall shape of the culture and history of the world. The characters are universally deep and well-drawn, and for the most part intelligent – I do so hate following around people who can’t see what’s happening in front of them. And the sequels! 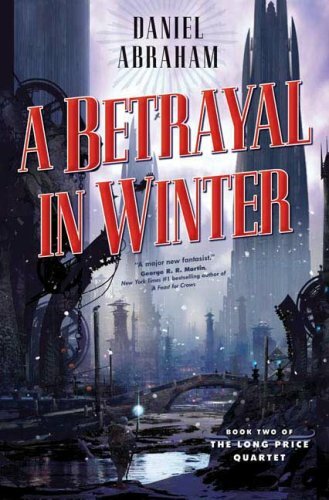 I’m about a hundred pages into A Betrayal in Winter, and the sense one gets is that the whole of A Shadow in Summer was necessary just so that you could understand what is happening in this book. It’s glorious, and I love it.